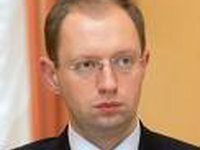 The leader of the Batkivschyna parliamentary faction Arseniy Yatseniuk has said that they hope that after leaving the faction MP Anatoliy Hrytsenko will resign from parliament. "The faction is grateful for [Hrytsenko's decision to leave the Batkivschyna faction]. People blinded by their own ambitions do much harm to the team's struggle," Yatseniuk said at a briefing in parliament on Tuesday. "There was an oath taken on the Bible. We expect, in accordance with the oath, that the next step will be laying down his mandate as a member of the Verkhovna Rada of Ukraine," the faction leader said. On January 14, Hrytsenko, the leader of the Civil Position Party and former defense minister, wrote a statement about his leaving the Batkivschyna faction in Ukraine's parliament.